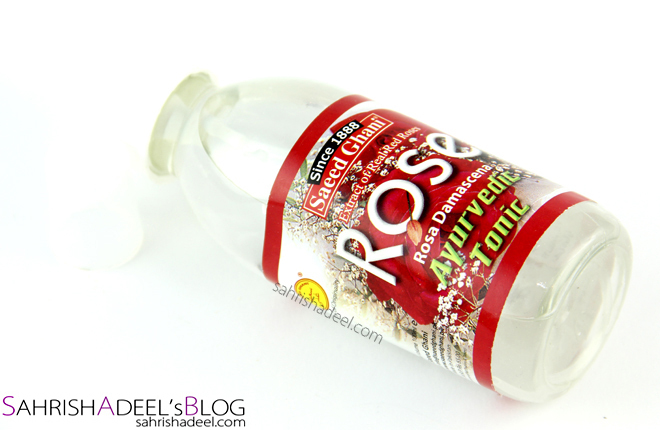 Saeed Ghani Rose Water - Review | Sahrish Adeel - Malaysia based Pakistani Beauty & Lifestyle Blogger! Cool mists on face are no doubt the best thing you can get in hot weather. My current favorite is Saeed Ghani's Rose Water for many reasons. I know it is quite chilly in many counties but mine stays hot throughout the year. Saeed Ghani’s Saeed Ghani’s rose water can be used by itself as a toner, used to moisten a mask, or used in place of water in lotions or cosmetics recipes. 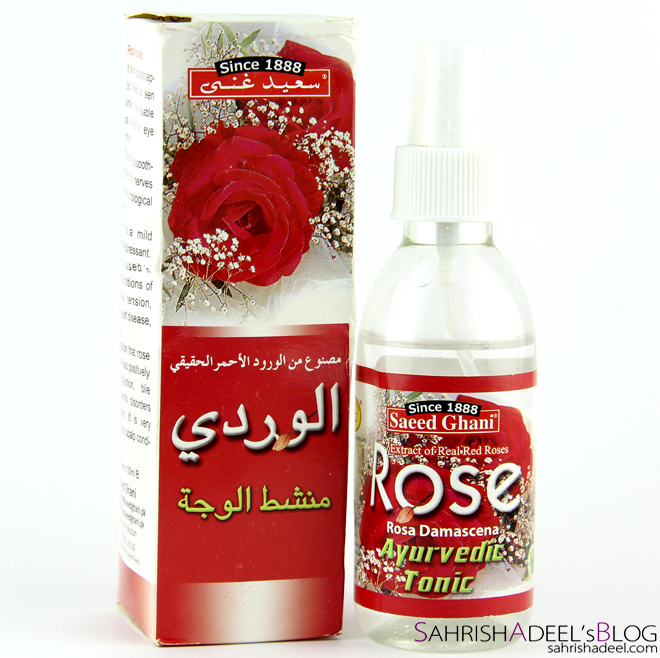 Saeed Ghani’s rose water stimulates the skin, heightening the blood flow. Rosewater controls and balances sebum production, making it useful for both dry and oily skin. It can balance and restore the skin's Ph and helps tighten pores. Its antibacterial properties help fight acne giving troubled skin a gentle, rather than a harsh treatment and are also useful in the treatment of all sorts of dermatitis. It contains 100ml of product and spray pump gives a really fine misty spray so it dries pretty fast. I used to use a mixture of rose water, glycerin and lemon juice like every night when I was in college. (too long ago) That used to keep my skin fresh, soft and hydrated because at that age, I was not allowed to use any other skin care products. Oh yeah, a facial before the age of 21 was like a crime back then. Time passed and I almost stopped using rose water for my skin but recently I got to try this one and I have been using it since I got it. I used to use one by Qarshi or Hamdard (don't remember the exact brand) before and I have noticed that the one by Saeed Ghani has a bit more intense fragrance of rose water upon application which gets really mild once it is dried. Unlike the one I previously used, Saeed Ghani's rose water dried to an invisible finish while the one I used before used to get a bit sticky/greasy. It clearly hydrates the skin and since it has the ability to balance pH level of skin, it locks in the moisture for good time. I usually mist it on my face and neck 2-3 times a day, mostly when I am feeling tired. And the mist if so fine that it dries in no time. As far as the use of a misty rose water for setting up the makeup is concerned; yes it helps to melts together all the powder but no, it does not help to make the makeup long lasting. 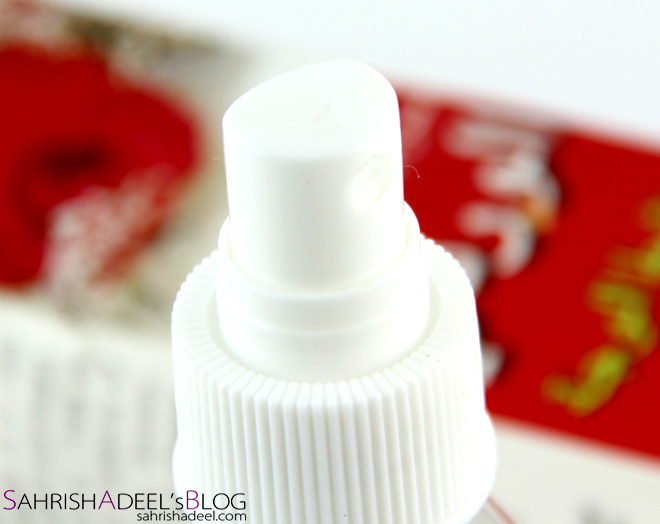 I have tried spraying it over my makeup just like I use my Fixing Mist by MUA. It gives dewy finish and takes down majority of the cakey-ness which is good if you want to go easy on your pocket because this thing is pretty inexpensive. I love how it makes my skin look less tired and helps to calm down the redness on the face a bit. You can also use this mist to damped the brush while using eye shadows since it claims to be anti-bacterial, if I am not wrong. Overall I cannot hate or dislike rose water ever for all good properties it has. You can totally use a rose water on your skin, as eye drops, drink it everyday to have good digestion or apply it in your scalp. I love it and I would recommend everyone to have atleast one bottle of rose water in your home. Tip: Keep a mist bottle in your fridge because nothing can calm you better than a cool mist of a rose water after you are done working in kitchen or if you have just came home from work. Saeed Ghani's Rose Waters costs pkr 250 and you can order it in a bundle along with other products from Daraz.pk (they ship internationally) or you can get Saeed Ghani's huge range separately at Just4Girls.pk (they ship within Pakistan).